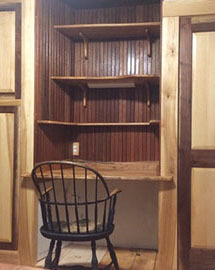 unique, custom hand-made furniture for office and home, built to order, with your choice of wood and finishes. 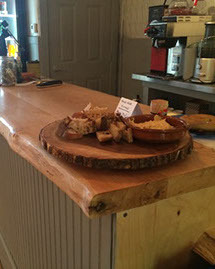 Beautiful, custom live-edge countertops, desks and farm tables built to order for your business or home. All species of wood available. No project too big or small! Prices vary so please contact me directly to discuss your project. 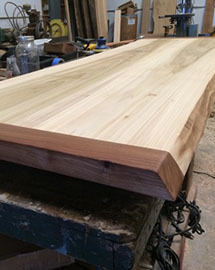 This is a made-to-order, fully custom dining table with breadboard ends. 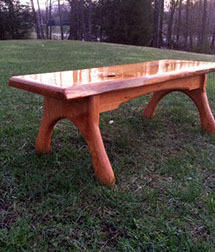 I can build any size table to perfectly fit your space in your choice of woods. The one shown above is crafted in pine with oak ends. A beautiful heirloom table that will see many family dinners for generations to come! Bench (and matching table not pictured) for interior or exterior use. Each piece uniquely fashioned to reflect the beauty of the natural material. 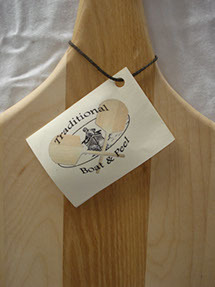 Can be built with your choice of custom milled wood, with a back or without. Here you can see some examples of my recent furniture pieces using the materials that I harvest and cut on my mill. All pieces are unique and built to order. Custom projects welcomed. 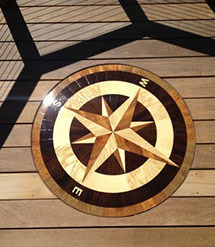 This was a custom piece used as a deck inlay and perhaps will spark your imagination for your own creative application. 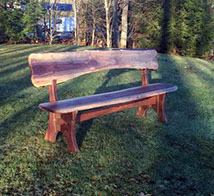 This verstatile bench can be built to any length and height making it suitable for children and adults alike. Can be built with your choice of custom milled wood. A classic with my own unique profile and custom cut wood. Can be built with your choice of custom milled wood. 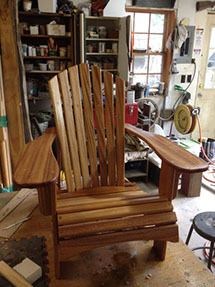 Prices between at $250 and $750 depending on wood selection and finish. 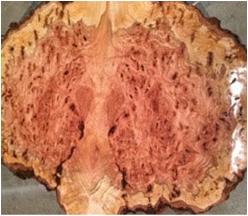 Showcasing the unique beauty of a natural burl in your choice of woods. Beautiful occassional tables or wall mounted as a feature artwork. Call for availability. 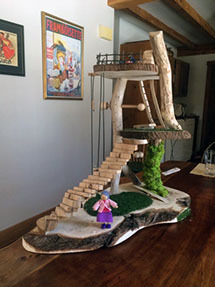 Kid tested, unique play house for engaging your child's imagination. Sure to become a family heirloom. Can be any size or configuration. 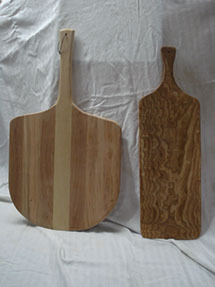 Given the nature of my work I always have an abundance of wood off cuts laying around the shop—perfect for one-of-a-kind cutting boards and pizza peels for your home. Always a changing selection, please contact me to find out what I have available or to request a special piece. I try to stock up around the holidays. 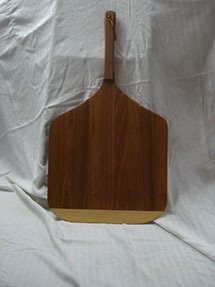 Prices start at $45, most between $60-$120 depending on the wood.